Published on September 24, 2007 in News. Closed Tags: consumerism, cuba, detials, global, socialism. Juice, Juice by Isaac Holeman. The adage you don’t know what you have until you loose it is realized in many interesting ways in Cuba. Some are positive, some are not positive. Some are just weird. 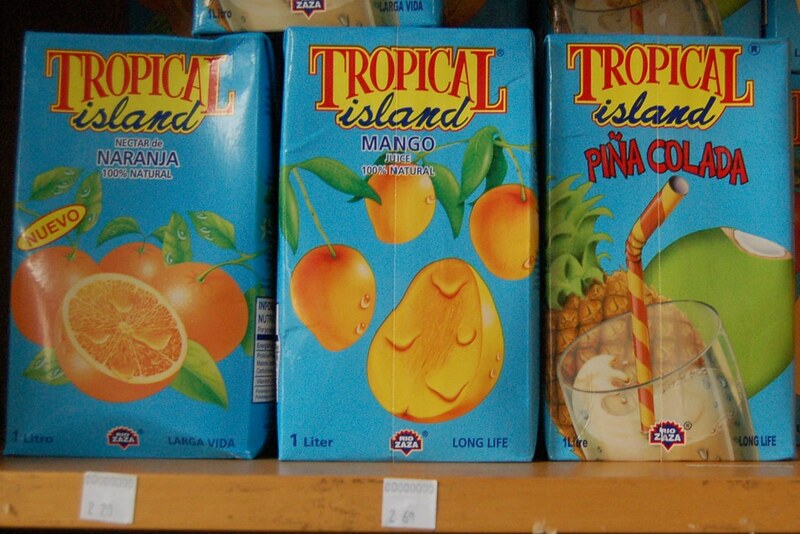 Fruit juice boxes like those pictured above are the fruit drink of choice or necessity in stores and restaurants all over Cuba. It’s the only brand you can get in most places. I think they highlight a very interesting difference between the consumerism we practice in the US and whatever it is they practice here. Look at the packaging. Functional, familiar, but look at the images. The pictures they are pushing are not fruit. They are subtly unappetizing. The cut in half mango and orange are supposed to be dripping with tangy real fruit juice, which is signified here by the flabby growths. Look specifically at the Mango’s flabby growths, the light source comes from above, a little to the left, and in between the viewer and the box, but the shiny bright spot on the side of this mango obviously indicates that a primary light source comes from the right and perhaps slightly above and closer to the viewer. This primary light source is probably supposed to the be same light that shines on the whole mangos to the left and in the background, but the placement of the three shiny spots is slightly uncoordinated, so each mango seems to have a unique light source. The mango on the right is just doing it’s own thing, I guess they haven’t figured out that you can’t coerce people into buying things that confuse them. A million light sources (see leaves, water droplets as well) for a batch of fruit that should have just grown out in the sun will not bring in the big bucks. The droplets of dew on the half mango, if you look closely, do not conform to the shape of the mango which means that they are actually dew pellets. In nature (where fruit should come from) I’ve only seen that in the sap of some conifers. Look at the vine the fruit grows on. Have you ever seen a mango tree? Was it a eucalyptus tree? I can vouch that the juice is very good, and it is probably organic (about 80% of Cuba’s produce is organic, according to a video I watched on peak oil and agriculture in Cuba). I would bet that it is nutritious, but the packaged whole looks so much less natural than the sugar from concentrate+food coloring they push in the US. I guess the poor Cubanos haven’t figured out that people will rarely waste their money to buy more than the can/should consume when so many of a product’s relevant details have been ignored. If they would just open up the economy, the invisible hand of competition would show them that it’s unnecessary to allocate such great resources to managing the quality of the juice. All that is necessary is to pay attention to these few important details that make the pre-purchase experience that much more tempting. Nearly a decade ago I co-founded a non-profit organization called Medic Mobile. We design, deliver and support world-class open source software for health workers who provide care in the hardest-to-reach communities. With support from a Gates Cambridge Scholarship, I recently completed a PhD in innovation studies and I now lead Medic Mobile's research efforts. My expertise is in human-centered design research and practice, with a focus on health equity, delivery innovation, doorstep care and new models of precision global health. After several years of many wanders, I'm now based in Seattle, where I enjoy being part of a vibrant global health community and being closer to my great big outdoorsy family.